Talos has both an unbreathably thin atmosphere and a lack of surface water making habitation by sophonts difficult. The system has a population between 10,000 and 10 million, lacking the industrial base to be completely self-supporting. 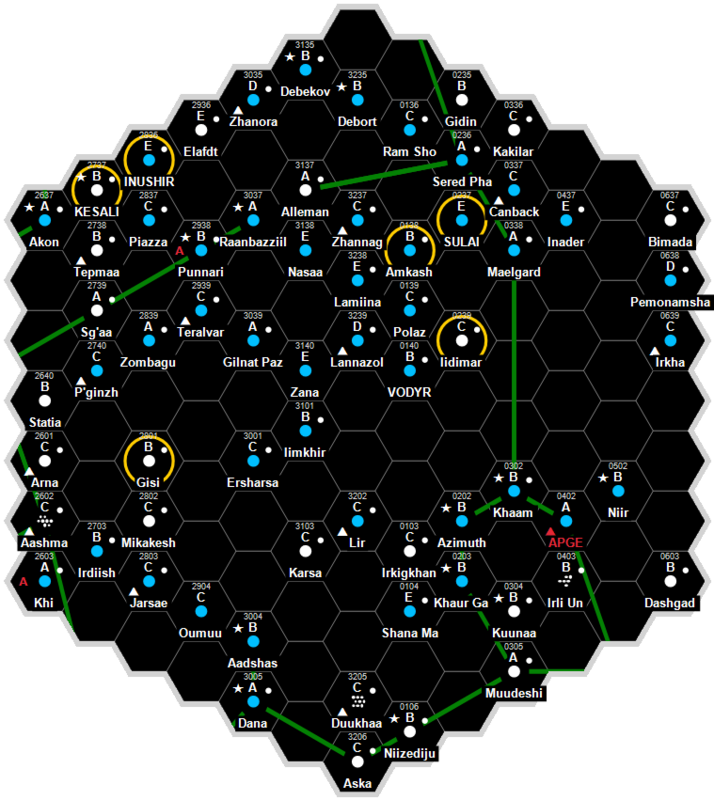 It is a Human dominated Non-Aligned world in the District 268 Subsector of Spinward Marches Sector. Talos has a unbreathably thin atmosphere and very little surface water. The system has a population between 1 million and 10 million sophonts, lacking the industrial base to be completely self-supporting. It is a member of Regency of Deneb in the Plankwell Subsector of Spinward Marches Sector. This world is an Interface world, with a quarantine inspection facility for all ships. Some suspect that there was a population on this world by the 400's, who were religious pilgrims from the Tizon Empire. Talos is a world shrouded in mystery. Neither the shipwrecked Rule of Man Solomani who colonized Noctocol (three parsects away) around -2000, nor the Sindalian Empire mining colony established on Collace (two parsecs away) in the -1400s recorded anything unusual about Talos before they lost jump capability. All early Darrian records concerning Talos were lost during the Maghiz, so the earliest documented account of the system that we have dates from a Sword Worlds survey expedition that visited Talos in -147. The scouts found evidence of sophont habitation in the form of highly-distorted, undecipherable radio signals. However, no further details could be learned because a massive (50 kiloton?) bronze-colored spacecraft of highly unconventional design that was in orbit around the planet moved to intercept and fired warning shots every time the survey ship attempted to approach. It was also evidently jamming all transmissions to and from the planet. There is a break in Sword Worlds records caused by the aftermath of the War of the First Rebellion, but Darrian archives indicate that the mysterious vessel was still standing sentry over Talos in Imperial year zero (0). However, by the time that the first Imperial scouts visited Talos in 151, the strange spacecraft had disappeared. The planet proved to be inhabited by what at first seemed to be an entirely unremarkable human population of about 250,000 that was living at Tech Level 7. The Talosians were entirely ignorant of the fact that a huge, alien craft had once orbited their world, and knew very little of their own history. There had evidently been a centuries-long period of severe technological and scientific regression (to TL-1) during which the facts about how, when and why the planet was settled had become lost in the mists of history. Talosian mythology is vague and includes many elements (such as divine intervention) that are patently absurd. It is also contradictory, particularly insofar as mythical accounts of the planet’s settlement incorporate both the themes of banishment for misdeeds (mirroring the Garden of Eden myth on ancient Terra) and of finding blessed refuge at the end of a perilous flight from monstrous enemies. The Sword Worlders had speculated that Talos was a Darrian colony that had become isolated after the Maghiz, but the Darrians themselves rejected this theory because the mysterious spacecraft bore no resemblance to any known Darrian design. When contact was finally made with the inhabitants, they were found to be genetically distinct from Darrians, Solomani, Vilani and Zhodani alike, and spoke a language that appeared to be entirely unique and unrelated to any other known human tongue. This has prompted most experts to theorize that the Talosians are the last survivors of an unknown spacefaring culture that had arisen somewhere in the Trojan Reaches and disappeared before the era of the Sindalian Empire (-2074 through -1441). The ‘Riddle of Talos’ was of interest only to historians and linguists until 708, when the mysterious vessel inexplicably reappeared, and resumed its former habits of intercepting all ships that attempted to approach the planet. It took nearly 100 standard days for the Imperial bureaucracy to make up its collective mind to intervene in a system beyond its borders, but when an Imperial Navy task force finally arrived at Talos, the intruder immediately disappeared. Imperial and Sword Worlds vessels were both present, but could not follow the craft as it moved off under extremely high acceleration (10-12G). Since no jump signature was detected and an intense search of the inner system revealed nothing, it was concluded that the intruder had fled to the unsearchable vastness of the system’s Oort Cloud. There have been dozens of reported encounters with the strange vessel in the remote, sunless reaches of the Talos System over the past four centuries, but none of these has ever been confirmed. The most widely accepted theory is that the intruder is an automated vessel that continues to mindlessly follow its ancient and inscrutable programming. The most fascinating and perplexing question, of course, is whether the craft was protecting the Talosians or imprisoning them on the planet, but other riddles abound. Whatever its purpose, why did the intruder disappear and then return five standard centuries later? Its flight from the Imperial Navy task force in 708 seems logical enough, but why has the intruder never returned to the inner system in the four centuries since? Last but not least, who or what built the vessel in the first place? Popular speculation on this last question inevitably points to the Ancients, whose homeworld has been tentatively placed in the neighboring Five Sisters subsector, but most reputable scholars reject this notion because human inhabitation of Talos is at most 2,500 standard years old. Talos was long designated an amber zone, but that classification was terminated in 1008 after three standard centuries had passed without any reported sightings of the intruder in the inner system. However, travellers should be aware that the vessel could possibly reappear at any time and resume its blockade of Talos. Although the rest of known space is endlessly fascinated by the ‘Riddle of Talos’ the Talosians themselves are not. Their society is extremely conservative, isolationist and politely, but firmly, disinterested in offworld affairs. Only a handful of Talosians speak Galanglic or any other ‘foreign’ language, and offworld visitors are rare and generally treated with courteous disdain. Anthropologists and sociologists have speculated that these the traits can somehow be traced back to the founding of Talos, but cannot agree on the reasons behind them. Although they are technologically capable of interstellar travel, the Talosians have not even bothered to develop an in-system spacefaring capability beyond that necessary to send communications satellites into orbit. And, despite the fact that Talos sits at a strategic junction where the Collace and Glisten arms of the J-1 Spinward Main intersect, no proper starport has ever been built and interstellar trade is minimal. This does not, however, prevent the Talosian government from making a hefty profit by charging visiting spacecraft exorbitant fees for refueling in the planet’s oceans (the system has no gas giant). Talos is governed by a council of hereditary oligarchs who rule a collection of small city-states scattered around the shores of the planet’s oceans -- each of which generally has its own E-class landing facility. Governmental institutions are minimal and neither provide many services to the inhabitants nor impose any significant restrictions on their economic, political and social freedoms. Although the climate is cold (average temperatures hover just above freezing) and the atmosphere very thin, the Talosians have created a sustainable society based on hydroponic agriculture, and small-scale industrial workshops and resource-extraction enterprises. Despite the low Law Level and easy availability of weapons, crime is rare and Talosian society has been at peace with itself for half a millennium. Dave Nilsen. The Regency Sourcebook (Game Designers Workshop, 1995), 49. Martin Dougherty, Neil Frier. Behind the Claw (Steve Jackson Games, 1998), 77. This page was last modified on 14 July 2016, at 19:43.